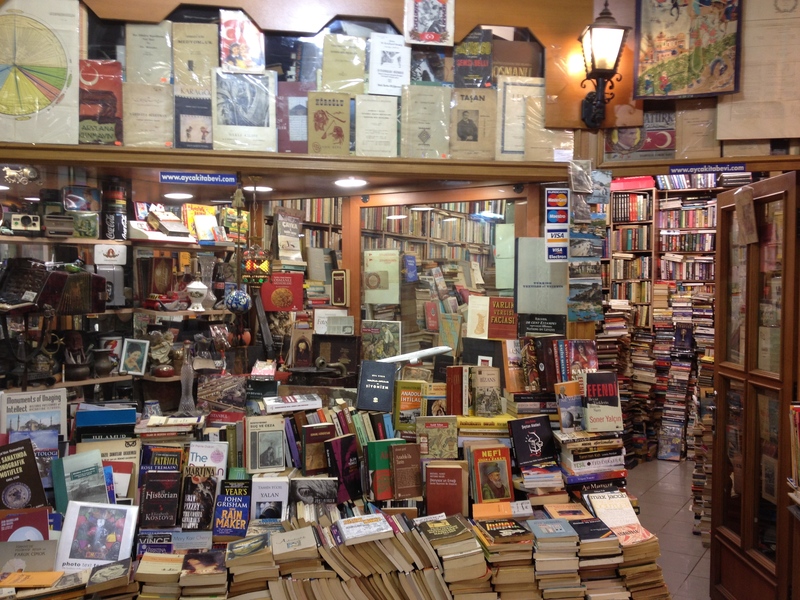 While browsing the used books in the Sahaflar Çarşısı (located in the Aslıhan Pasajı off of Istiklal Street in Beyoğlu, Istanbul) we came across a corner bookstore called Ayça Kitabevi. Inside I found a stack of mostly old Ottoman books, but intermixed with these works were a few Arabic ones. After going through the store’s small collection I ended up purchasing a copy of the Qur’an printed in Mecca, whose publication date is unlisted (according to the text this edition was verified in Ramadan 1366/July-August 1947), and a two-volume Arabic tafsīr or commentary of the Qur’an. Both volumes of the text are in fairly poor condition. The cover to volume two, for example, has been previously “repaired” with tape. The tafsīr in question is entitled Kitāb al-Futūḥāt al-rabbāniyya fī tafsīr mā warada fī al-Qurʾān min al-awāmir wa’l-nawāhī al-ilāhiyya and was written by Muḥammad ʿAbd al-ʿAzīz al-Ḥakīm. According to the introduction the author’s full name is Muḥammad ʿAbd al-ʿAzīz al-Ḥakīm Ibn ʿUmar Rāsim b. Ḥusayn b. ʿAbd al-Raḥīm (vol. 1, p. 3). Consulting al-Ziriklī, the author, who also bears the nisba al-Kuraydī, appears to have died in 1324/1906 with this tafsīr listed as his only work of note (al-Ziriklī, al-Aʿlām, vol. 4, p. 24). This date of death cannot be correct if the tafsīr itself is to be believed. The colophon to the second volume states that the work was completed on Monday 29 Safar 1324/23 April 1906. However, the colophon to the first volume states that that volume was completed a year later on 12 Rabīʿ al-Awwal 1325/24 April 1907. It would seem that volume one was finished after volume two and that the author was still alive in 1325/1907. The text is an aḥkām al-Qur’ān work. Based on the repeated Qur’anic injunction to command the good and forbid the wrong, the book is divided into two volumes; one deals accordingly with divine commands (awāmir) and the other with divine prohibitions (nawāhī). The first volume is 352 pages with 4 additional pages of corrections and the second volume is 354 pages also with 4 pages of corrections. Neither a date of publication or publisher is given in the work. The book appears to be rare. 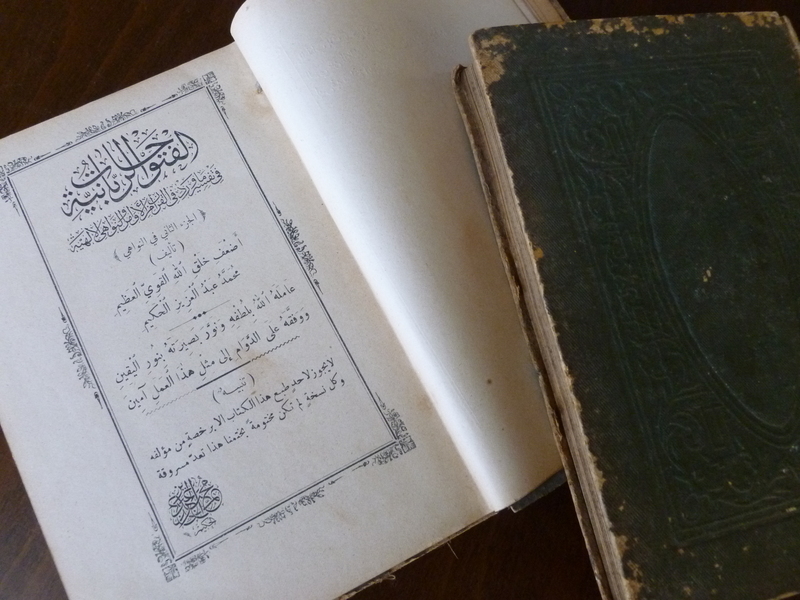 Checking the libraries catalogued on WorldCat the tafsīr only appears in the collection of two libraries: the University of Minnesota, Minneapolis and Brigham Young University. The edition that they have, however, is a later printing. 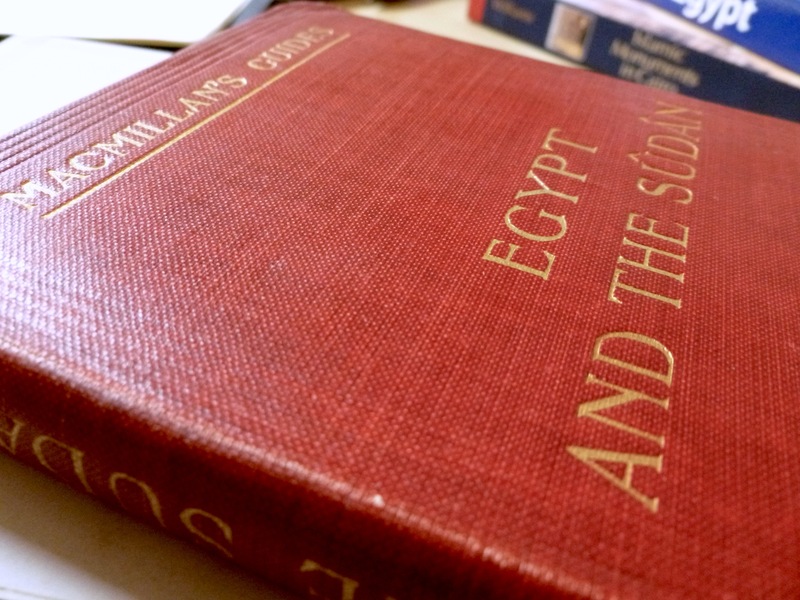 We know this because their edition, which was published in 1936 by Maṭbaʿat el-Mahmūdiyyah in Cairo, has both volumes printed together as one, whereas as the present edition was printed as two separate volumes as it was initially intended. If anyone can shed further light on this work or its author Muḥammad ʿAbd al-ʿAzīz al-Ḥakīm, it would be greatly appreciated. My eyes quickly scan the spines of books lining the overburdened shelves, stacked and piled with patient tomes. The letters are familiar, my mind registers them as English, however the words are Turkish. My brain struggles to make sense of the jumbled script and forces my eyes to settle on words I can understand. New York City Guide. This is no ordinary guide to New York City, the greying hard cover, weathered binding and strained spine reveal its age. 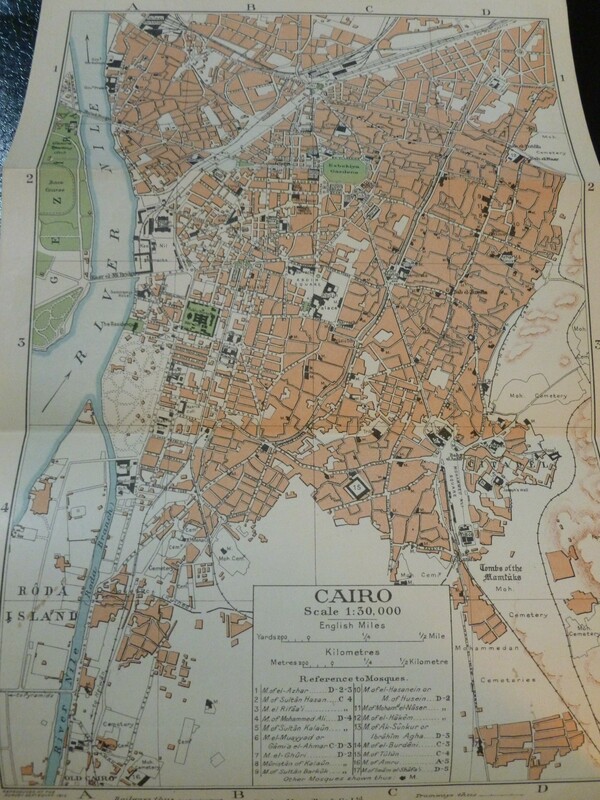 Instinctively I turn to the verso to find it is a 1939 print. While Martin is methodically searching through shelves and amassing his own collection of books, I settle into a chair on the dusty 4th floor of Simurg Bookstore. I skim the table of contents and flip to the index searching for any indication of Muslims living in Lower Manhattan. I’ve read contemporary studies, newspapers and opinion pieces of the evidence supporting the existence of places such as Little Syria. The case for Muslims being a part of New York’s unique tapestry has been made. 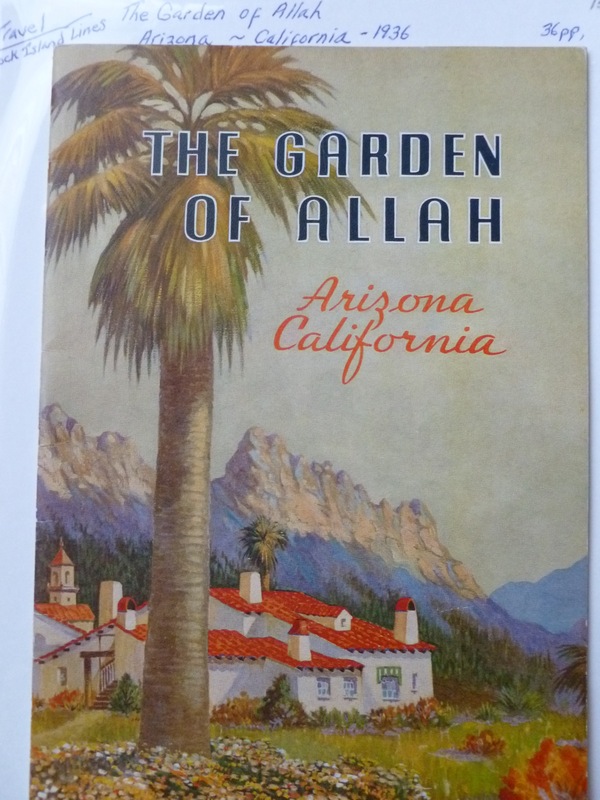 However, at times I need the evidence to manifest itself to me – to appear in a 1939 guidebook. I need for the rosy fragrance of deteriorating pages to invade my senses, to witness acidity yellowing the pages, to feel the strain of cradling a heavy book on my wrists. I want to read paragraphs, uninhibited by an author’s interjections, on the Muslims of New York. At a time when hotels were rented for $2.00 a night, subway fare cost 5 cents, and traveling via steamship was normal, baklava was being sold on the street corners of Lower Manhattan. 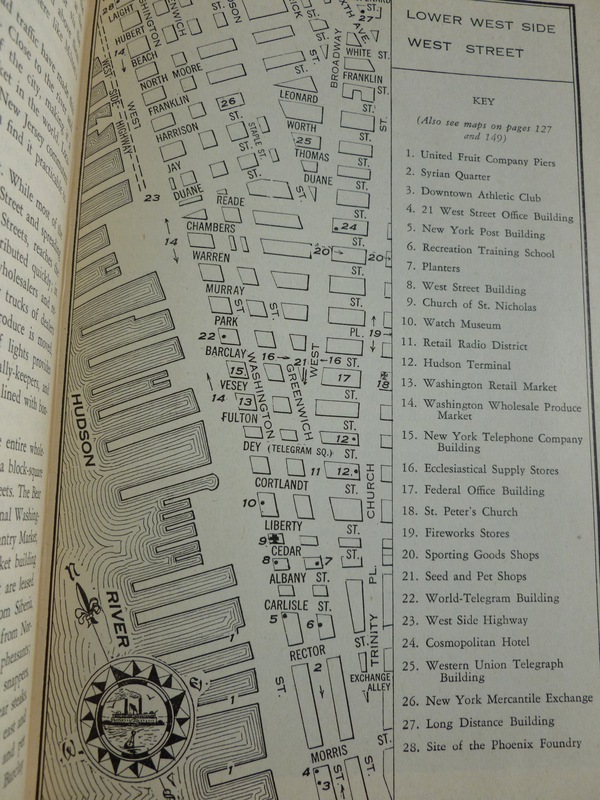 In the market section, comprising a world of its own, is the Syrian Quarter, established in the late 1800’s at the foot of Washington Street from Battery Place to Rector Street. A sprinkling of Turks, Armenians, Arabs, and Greeks also live here. Although the fez has given way to the snap-brim, the narghile has been abandoned for cigarettes, the coffee houses and tobacco and confectionery shops of the Levantines still remain. 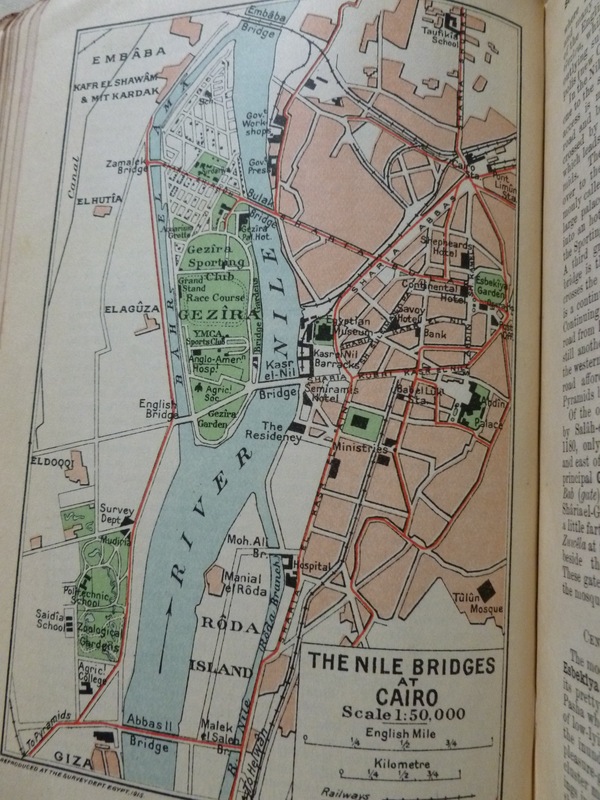 Flipping between the index and the text, my fingers interlaced with the pages, I learn that in addition to Syrians residing in Lower Manhattan they also lived in Brooklyn. Entranced, I continued to search. What else could I find? And what exactly was this treasure I had found? A few months later, and back in the states I learned that the guidebook I stumbled upon in Istanbul is only one of an impressive series of books, all part of The American Guide Series – the first guidebooks to cover the states and regions of the United States. This warranted a trip to the library where we picked up a few more books on the guidebook series and the program that started them. In the mid 1930’s and in response to the Great Depression, President Franklin D. Roosevelt established the Works Progress Administration (WPA) as part of the New Deal. The WPA was enacted to employ millions of workers in public works projects. One of the more creative WPA projects was the Federal Writers’ Project (FWP); this division was created to support written work and writers during the Depression. The Federal Writers’ Project relied upon struggling writers to document the peoples and places of the United States. Many notable writers held modest careers as FWP writers, including Studs Terkel, Ralph Ellison, and Zora Neale Hurston. More can be found on the WPA and the Writer’s Project in Soul of a People (book and documentary). The American Guide Series and the research that went into it ended up being an incredible anthropological study of the American people. I found that the New York City Guide is the companion volume to New York Panorama, a broader view of the city’s life and history. The Panorama provided even richer details of the early immigrants. Of the three near-Eastern groups, the Syrians have the largest population in the city, numbering 30,000 throughout greater New York. 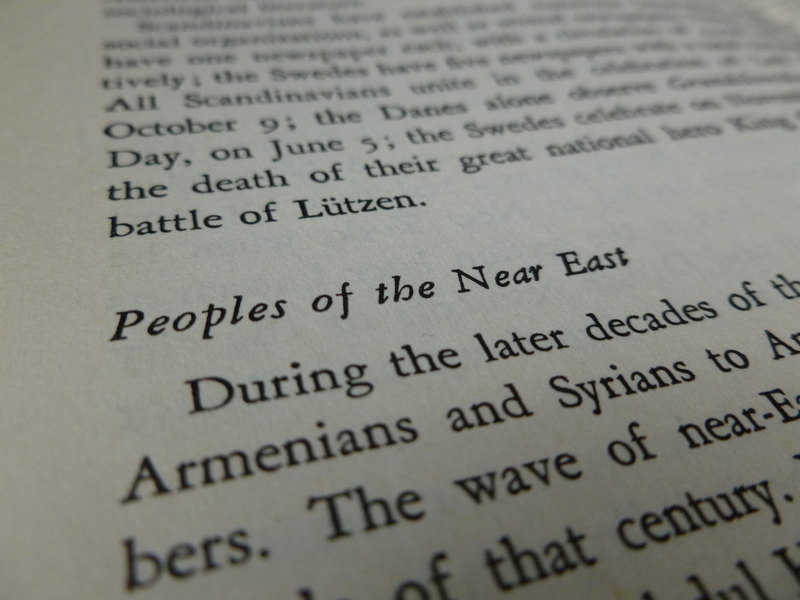 The Armenians come next with 22,000, while the Turks in New York number only about 300. Only 1,000 of the city’s Syrians live in Manhattan, along Washington Street between Morris and Rector Streets. The largest Syrian colony lies between De Graw and State Streets, running from the East River to Hoyt Street in Brooklyn. A smaller settlement has grown up in the Bay Ridge section of Brooklyn. The Turks are settled mainly along Rivington and Forsythe Streets in Manhattan. Armenians and Syrians in the city are almost without exception Christian, the former adhering to the Gregorian Church while the latter have formed a number of sects related to the Greek Orthodox and the Greek and Roman Catholic Churches. St. Joseph’s Roman Catholic Church at 57 Washington Street, best known Syrian church in the city, conducts services in Syrian. In many ways, Michael Gomez says it best, “arguments are necessarily more tentative than conclusive…” (Gomez 1998, 60). Despite the hopes I once held for Muslim Syrians in Lower Manhattan, a mere two sentences on the Turks has abated my disheartenment. 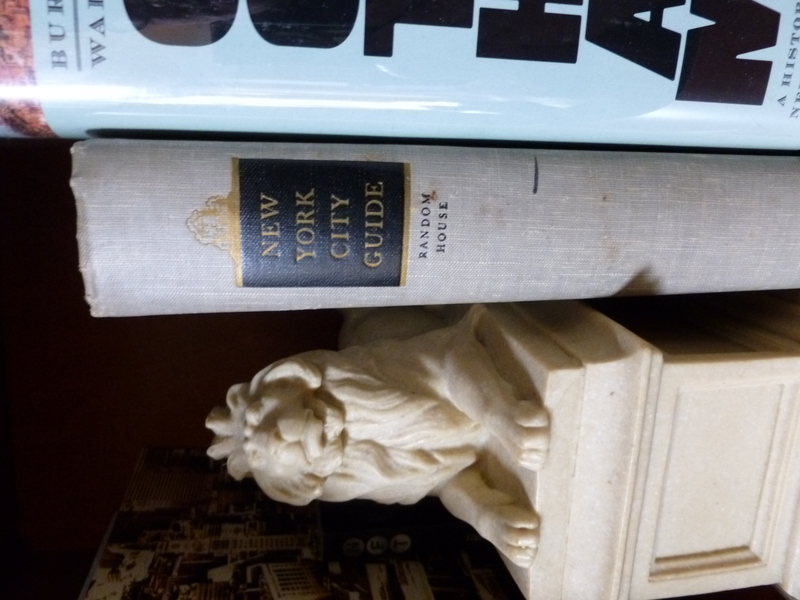 How appropriate is it then that I found the New York City Guide tucked away on a dusty shelf in Istanbul. Somewhere in the pages, interspersed between the lines lies a fleeting truth. I am caught between discerning facts and waiting for unanticipated discoveries, clinging to the fine details. Culling for the truth and always hoping for something more, these small nuggets of information keep the search alive. Gody, Lou, Chester D. Harvey, and James Reed, eds. 1939. New York City Guide. New York: Random House. Michael Gomez. 1998. Exchanging Our Country Marks. Chapel Hill: The University of North Carolina Press.